Shinpei Takeda’s artwork has been nominated for an award of the 2012 Orchids and Onions Ceremony. Here the artist finishes up his ceiling at the Brighton Ave. Comfort Station at the beach. 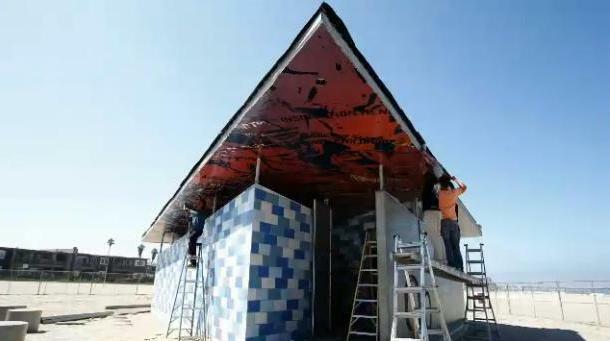 Tonight – Thursday, October 11th – the San Diego Architectural Foundation holds their annual Orchids & Onions Awards Ceremony and rumors are abounding that the recently-completed Ocean Beach comfort station will receive some kind of award. This annual event is a way, as touted by the San Diego Architectural Foundation, for San Diegans to “take an active role in the celebration and condemnation of their environs”. The 2012 Orchids & Onions Awards Ceremony & Silent Auction will hand out 19 project awards. The Awards Ceremony begins at 8:30 p.m. in the museum’s Sherwood Auditorium of the Museum of Contemporary Art San Diego in La Jolla, and TV host Sam Zien, of “Sam the Cooking Guy,” will serve as Master of Ceremonies. Awards will be presented by numerous other guests throughout the evening. A pre-party and auction begin at 6 p.m. at the Museum. Well, what about those rumors? The comfort station or public restroom – as most call it – at the foot of Brighton Avenue at the beach has been the focus of both detraction and envy since it was built and completed earlier this year. Shinpei Takeda, the artist of the building, has been criticized by one individual in the community for using quotes from the OB Rag in the artwork on the ceiling. Takeda has since come out and defended his piece, and has called for a public discussion of art and free expression. Takeda earned a nomination for an Orchid Award from the San Diego Architecture Foundation for the artwork of the comfort station, which will be announced this month. Hence the “rumors”. The actual list of winners is a closely guarded secret that will not be unveiled until tonight at the Ceremony. Each year, a jury of design professionals and artists is selected to determine the official Orchids & Onions based upon public nominations. 149 qualifying nominations were received this year; 134 for Orchids and 15 for Onions. The jury’s first step is an electronic pass of all the nominations submitted. They then tour the highest-ranking projects to determine the official Orchids & Onions recipients. The 2012 jury is comprised of Robin Wilson Carrier, Principal at Robin Wilson Interior Design; Nathan Lee Colkitt, Principal/CEO at Colkitt & Co.; Catherine Herbst, Partner at Rinehart Herbst and Undergraduate Chair of Architecture at Woodbury University; Marcie Harris, Principal at Marcie Harris Landscape Architecture; Christopher Puzio, Artist & Designer ; and Gregory Strangman, Managing Partner of LWP Group. In previous years, public People’s Choice voting was limited to the one project they deemed most worthy. Now, the public may vote on ALL of the People’s Choice nominees (21 total) based on a ranking system. Pauly De Bartolo of De Bartolo & Rimanic Design Studio and Ivana Vinski of RKTEQU are this 2012 program co-chairs. De Bartolo explains, “This new feature of People’s Choice voting encourages more public input, thereby offering the citizens of San Diego even more of a say in what they like and don’t about how San Diego is designed and developed. Another new element of O&O is in the form of an exhibition called Orchids, Onions & Opportunities , offering continued and ongoing examination, information and visions, based on the realities of the present, inspiring examples from around the world of what has worked well, and the range of possibilities for the future of San Diego. The exhibit is viewable through the end of the year at 877 G Street. Hours vary. Viewing appointments are available by calling 619-232-1385, or sending a note to info@sdarchitecture.org. The always-exciting annual gathering of architectural aficionados and the Who’s Who of San Diego’s design community, tickets for the highly anticipated 2012 Orchids & Onions Awards Ceremony & Silent Auction are on sale now at www.orchidsandonions.org, and, if available, also sold at the door. Prices range from $40 to $115 for General Admission and VIP parties.